Want the best music gifts for musicians in 2018? This is the ultimate guide! We’ve got the best music gifts for music lovers, regardless of your budget. We’ve put together a huge list of the best music gifts for musicians: find the best gifts for the music lovers in your life. Use the links below to skip to a specific price range, or start scrolling to see everything. For top musician birthday gifts, Christmas gifts, anniversary gifts, or ideas for any other occasion, we’ve got you covered. If you play music yourself, this list covers some of the best products and coolest music gadgets… Treat yourself to something new and exciting (you deserve a reward, right!?). It’s worth mentioning that this is a list made by musicians, for musicians, and there’s a strict no junk policy: Each of these music gifts has been put under the microscope and thoroughly researched, so you can be sure you’re buying high quality, interesting, and actually useful music gifts… Our finger is on the pulse to make sure that only the best gifts for musicians make it on this page. This means that if a company has bad customer service, poorly made products, or just junk gear, they’re not going to appear on this music gifts list. So what do we have in this music lovers gift guide? There’s the perfect balance of professional musician’s gear, cheap music gifts, cool music gadgets, and some fun novelty music gifts. However, we’ve made sure that even these novelty music gifts are still actually useful. As well as covering most instruments, we’ve got top gifts for singers, music students, music lovers, and ideas for great gifts for music teachers. If you’ve reached the bottom of this page and still can’t find a good gift for your music lover, get in touch and we’ll help you out. Note: All price ranges are in US Dollars. The links below will take you directly to Amazon, where you can see the best prices for each of these music gifts. This section is for people searching for the best music gifts on a budget. We’ve covered the best cheap music gifts, and avoided the junk… All of this stuff is actually useful. Buy one of the gift ideas below, or combine a few of them to create a great pack of music themed gifts. There are ideas here for both musicians and music lovers, to help you find the right gift no matter who you’re buying for. This is a beautiful high-quality rosewood stand for acoustic guitars, electric guitars, bass guitars, banjos, ukuleles, mandolins, and similar instruments. These stands are excellent gifts for musicians who play a stringed instrument, and they stand out from the other cheaper music stands out there. NEUMA’s stand is designed foremost with protection in mind… The stand itself is very well-balanced, sturdy, and there’s soft rubber wherever the instrument makes contact. The quality of these stands is great, made with deep red rosewood, a great finish, and precisely-cut pieces that lock together. It’s worth mentioning that these NEUMA rosewood stands are excellent music gifts for travelling musicians, because they fold up flat for easy transport. They take up much less space than a typical stand, and look a lot nicer. Best of all they’re great value for money, which makes these guitar stands perfect gifts for musicians if you’re on a budget. This Is Your Brain On Music is a bestselling book on the science behind music and the human brain. If you’ve ever wondered how or why people enjoy music, this is the book for you. Despite delving deep into the neuroscience and psychology of music, it’s actually quite easy to read thanks to author Daniel Levitin’s great way of explaining things. His expertise in both neuroscience and music makes him the perfect writer to take readers on a stimulating journey through everything we know about music. There are fantastic insights and facts, and all information is referenced for readers looking to explore things more deeply. These are great gifts for music lovers of all ages, regardless of their skill level, instrument, or music style. The paperback version is super cheap, making these books perfect budget music gifts. If your musician carries a lot of cables to shows, rehearsals, or just around the house, Planet Waves elastic cable ties are the best way to get organized. These cable ties are inexpensive, but they’re built with musicians in mind… They clip onto any standard sized cable and have a rubber tie which holds tight. If your musician sings, plays guitar, bass, keys, electronic drums, or any other electronic instrument, they’ll definitely use these cable ties. They’re great gifts for musicians because (like cables) these are something you can never have enough of. If you’re looking for practical music gifts, these are perfect. This is an essential tool for guitar players. The Ibanez Quick Access Multi Tool has everything needed to make quick guitar adjustments and repairs, and it’s perfect for unexpected problems while performing or setting up. The tool has six hex (a.k.a Allen) keys, three different screwdrivers, a tube spanner, and a ruler, with everything folding neatly into the body. This multi tool is priceless for when things unexpectedly break or come loose, especially while on stage. This makes the Ibanez Quick Access Multi Tool one of the best cheap music gifts for guitar players, and something they’ll find extremely useful. Musicians need cables. Always… No, really. So, they’re a go-to choice if you’re looking for the best music gifts that won’t break the bank. Regardless of whether you’re rehearsing, recording, or playing live on stage, it’s a great idea to have extra cables handy. You can pay a lot of money for some cables, but there are also some quality options out there if you need a super useful and inexpensive music gift… You just need to know where to look. Planet Waves makes excellent quality instrument cables, so it’s a given that these are one of the best cheap gifts for music lovers. These are quality USA-made cables for guitars, bass, keyboards, electronic drums, or recording gear. Spare cables can be a life-saver if you loose, forget, or break one, so don’t let your musician get caught out. You can get a 10 foot Planet Waves instrument cable for under $20, which means these cables are perfect inexpensive gifts for musicians. Turn just about anything into a guitar pick… This pick punch will create guitar and bass picks from anything you can find (like old credit cards, hotel keys, plastic bottle tops, CDs, plastics, vinyls, etc.). The picks that come out are standard shape and size, with the thickness depending on the material you’re using. If you don’t have anything to turn into a guitar pick, there are also pick punch sheets available: these are strips of plastic with different patterns to create personalized picks. The pack shown here comes with the pick punch, two pick punch sheets, and a pick holder. These are great budget music gifts for adults and kids (they’re safe for just about any age). This is a top quality music notebook to write songs and keep track of ideas. As well as a being great looking, this notebook has a built-in pocket, wrap-around elastic band, and music ruler included. Moleskine notebooks are excellent music gifts for students, or as graduation gifts for musicians… Moleskine is a great brand, and this music notebook will be something worth keeping (it’s much nicer than a standard cheap music book). For this fact alone, we’re more than happy to recommend these notebooks as a top music gift. The off-white paper is thick and very high quality, with music staves printed on one side and blank space for notes or lyrics on the other. This is one of the best music gifts for music lovers who write and create music, and it’s sure to be a hit. Tip: These music notebooks also make perfect gifts for music teachers. Mosh Potatoes: Recipes, Anecdotes, and Mayhem from the Heavyweights of Heavy Metal. This amazing recipe book has 147 recipes from some of the biggest names in heavy music, including musicians from Guns N Roses, Motorhead, Ozzy Osbourne, Alice Cooper, Anthrax, Dillinger Escape Plan, Megadeth, and a lot more. Don’t know any of those bands? Well if you’ve got a heavy-metal music lover, all you’ll need to know is that this is the perfect music gift for them. Along with recipes, you’ll find anecdotes, stories, and blurbs from each of the musicians featured. This is one of the best music gifts for music lovers who like it loud and heavy. If your musician doesn’t listen to heavy metal, then check out Eat Like A Rock Star, with musician recipes from a wider range of music genres. Musician’s Coffee Mug: For the musician who needs a good cup of tea or coffee before playing, a personalized mug is a great music gift. There are a huge range of options available, so you’re sure to find the perfect gift for your music lover. For the musician that needs a good cup of tea or coffee while playing, Vater also make a clamp-on drink holder designed to attach to a music stand or drum stand on stage. Keep hydrated while playing! Music Note Tea Strainer Pack: For tea-loving music lovers, these are the ultimate music gifts. These tea strainers are shaped like music notes…. Fill the note’s body with loose leaf tea, and then hook the top of the note on the rim of your mug to steep. There are two tea strainer notes in a pack, and they’re excellent value if you’re looking for useful and cheap music gifts. BBQ Rock Guitar Tongs: Play some air guitar in between flipping the steaks with these music themed BBQ tongs. Made from high-quality stainless steel with a sturdy wooden handle, these extra-long tongs (15.4″) are perfect for the BBQ, to avoid burns and to reach right across the grill. There’s also a BBQ Rock Spatula for flipping burgers. Both of these are perfect music gifts for music lovers who also love to barbecue. Guitar-Shaped Silicone Ice/Jello/Chocolate Mold: This mold makes three large guitar-shaped ice cubes for drinks, and two smaller music notes. The silicone molds are also great for making jello, chocolates, alcohol-based party treats, anything else you can think of. The guitar necks are designed to stir drinks, and they can be either frozen into the ice cubes, or left out. With the guitar necks removed, the mold makes full guitar shapes. These are excellent music gifts for music lovers who like a cold drink, or who like to make their own chocolates or jello. Retro Vinyl Drink Coaster Set: These are perfect gifts for music lovers, regardless of whether they play an instrument or not. Great for the coffee table or bar, this pack of six drink coasters feature non-slip rubber bottoms and non-stick silicone tops. Each coaster has a different design, along with realistic detailed vinyl grooves. If you’ve got slightly more to spend, there are some excellent music gifts out there… Here are some of the best music gifts between $20 and $80. We’ve got a good mixture of cool music gadgets for musicians, useful tools for getting creative, and a lot of fun stuff for musicians birthday gifts, anniversary gifts, or Christmas gifts. This amazing little device allows guitar and bass players to plug headphones directly into their instrument, to play without needing an amplifier or effects pedals. These are excellent music gifts for musicians to practice bass or guitar no matter where they are. The unit has volume, gain, and tone controls, and an effects button with nine different effects options. The plug folds away, and the batteries (included) can handle up to 17 hours of use before needing replacement. Vox is a top brand in the guitar world, and this product is excellent quality, with solid construction and a great sound. Importantly, there’s also an Aux input so your musician can plug in their phone or music player, to jam along to music, a metronome, or anything else. Beyond just playing quietly with headphones, this little device allows guitarists to plug directly into a stereo or portable speaker (e.g. the BOOM 2 reviewed below), to create a great sounding setup without needing to carry an amplifier. These are excellent music gifts for guitarists or bass players: they’ll be able to practice anywhere, anytime, and plug into headphones, a stereo, or any speaker with an auxiliary input. Tip: There are a few options available… The AC30 (shown above) is the best gift choice for all general-purpose electric guitar playing. Otherwise take a look at the blues, classic rock, metal, or bass guitar versions. Click here to check out all of the available options. These are great music gifts for musicians wanting to easily record high quality audio on their mobile device. The iRig 2 plugs directly into an iPhone, iPad, or Android device, allowing musicians to record electric guitar, bass, keys, or electronic drums. On top of this, iRig’s AmpliTube app gives access to a huge range of effects, amplifiers, and other gear to create some great sounds. Vocalists aren’t forgotten either: There’s a microphone version of the iRig available (called the iRig Pre), and these are great music gifts if you’re buying for a singer. As well as an input for instruments, there are headphone and amplifier outputs, allowing live performances using AmpliTube’s great effects. This means that your musician can use effects like reverb, delay, fuzz, overdrive, chorus, amp models, and a lot more, all without needing any other gear or effects pedals. Beyond just recording, these features are great for jamming, playing on stage, or practicing silently with headphones. There’s a switch to change between using AmpliTube’s effects, or selecting a clean signal output. Importantly, there’s also a gain dial to get the perfect input level regardless of the instrument or microphone you’re using. The iRig can also be plugged into portable speakers (like the BOOM 2 reviewed below), allowing music to be played anywhere, without needing any other gear. These are top gifts for musicians who write their own material, with everything they’ll need to play and record through their phone or tablet. Check out the iRig here. This little wooden DIY music box lets music lovers make their own songs on the included musical paper. Simply write out a song, punch in the notes with the included hole punch, and feed it into the piano to play. The handle on the side turns to play music by feeding the paper through the box. Papers can be stored in the top compartment of the music box, and extra music paper is available so the songwriting never has to end. These are cool music gifts for musicians of all ages, and something really unique. If you’re looking for DIY gifts for music lovers to have some creative fun, these are perfect. Younger musicians will learn melody and songwriting skills, and older music lovers can create some really complex arrangements. Check out the DIY Music Box Piano here. Tip: When you give this music gift, send your musician to musicboxmaniacs.com for downloadable songs, an online melody editor, and music making guides. This website has everything you need to write music box songs, even with no prior music-writing experience. There’s also an app called Music Box Composer available for Apple and Android devices. With the website or the app, your music lover will have everything they need to write great tunes. This is one of those really unique and cool gifts for music lovers, and it’s something they’ll use daily. This guitar amp key holder mounts on the wall, giving you a place to plug in the keys when you return home. There are six jacks to hold keys, and each key ring plugs directly into the main unit (like a real guitar amp). Use it for the house, garage, studio, or for keeping spare keys organized. This USA-made key holder comes with a wall mounting bracket and hardware, so your music lover will have everything they need to install it. All materials used are high quality (wood, vinyl, nickel plating, and powder coated steel). There’s even a working light with on/off switch on the front (and yes, the battery is included). There are a few different design options (see them all here), meaning you can get a more personalized music gift to suit the taste of your music lover. The guitar amp key holder is one of the best gifts for music lovers, especially if they’re difficult to buy for: It’s high quality, super useful, and it’s almost certain they don’t already have one. Tip: If this is a gift for a guitarist or bass player, add a nice leather guitar pick holder for their new key ring. Note: There are some cheaper versions of these music gifts out there, made with plastic and stickers. Avoid these, because they’re much lower quality. Make sure you buy this version we’ve reviewed above (made by DropLight). Hearing protection is quite simply one of the best music gifts you can give. Vibes are hearing protection earplugs designed specifically for live music (both playing and listening), cutting the volume in a more natural-sounding way. These earplugs give you a much more accurate sound representation compared to cheaper options like disposable earplugs, while still reducing the volume and saving your ears. As a musician, this is great: it’s extremely important to protect your hearing, but you also need to keep an accurate idea of your own sound. Quality hearing protection is one of the best gifts for musicians, and Vibes are made specifically for live and loud music. For the price range, Vibes High-Fidelity Earplugs are excellent. These earplugs give an average 22 decibel reduction, which is a nice balance that protects hearing but still keeps things lively. When playing music, the sound remains fairly accurate and enjoyable across the low, mid, and into the higher frequency range (with a slight cut to the highest frequencies). Unlike a lot of other earplugs out there, the sound isn’t overly muffled or lifeless. As well as the earplugs, Vibes comes with a pocket-sized hard case, and three different interchangeable earplug sizes in the box (small, medium, and large). Vibes gives the perfect amount of hearing protection for playing music or watching a concert. They’re great music gifts on their own, or as stocking-stuffers to go with other gifts. As a little bonus, Vibes gives part of the sale to the Hear The World Foundation. This means you’ll be giving a gift to your music lover, and also to someone else in need of some hearing help. For their low price, these are the absolute best headphones you can buy… they’re excellent value for money. AKG’s K 240 headphones are great-sounding and great-looking, and they’re made for both musicians and music lovers. The sound of the K 240 is punchy, crisp, and full, which creates a very enjoyable music experience regardless of the music style. These headphones are solid, well-built, and they’re also comfortable to wear… they’re not heavy (despite their look), and they’ll fit any head size. The flexible steel and suspension band around the top is designed to quickly adjust to the wearer. Importantly, the cable on the AKG K 240 is replaceable. The cable is the first thing to wear out on any set of headphones, so it’s great to see AKG are thinking about longevity here. The cable has a 3.5mm stereo plug for phones, computers, and other consumer audio gear. There’s also a 6.3mm adapter included, so these headphones can be used with professional audio gear and recording equipment. For a great set of musician’s headphones that won’t break the bank, the AKG K 240 are the perfect gift for the music lover in your life. Check them out here. Tip: If you’ve got a little more to spend, check out the Audio-Technica M50x Headphones (below), which are a nice upgrade. These guitar capos are some of the absolute best on the market, and they’re really special gifts for guitarists. Thalia Capos are beautifully crafted, with a high quality design backed by a lifetime warranty. Thalia is actually a small family-run company based near San Francisco USA, but they’ve made a big mark worldwide. Thalia Capos will fit acoustic guitars, electric guitars, classical guitars, and banjos. There are 14 interchangeable fret pads, ensuring they’ll fit any guitar perfectly. The capo also comes with a jewel case, quick-start guide, microfiber gig bag, sticker, and a Santos Rosewood guitar pick. Every guitar player needs at least one capo, and this is guaranteed to be their go-to choice every time. These capos are stunning gifts for guitarists, and they’re something they’ll keep and use forever. The wonderful design makes Thalia Capos perfect graduation gifts for musicians, or for any other special gift occasion… This is as much a piece of art as it is a solid and highly versatile guitar playing tool. Take a look at the range of stunning designs here. Okay, the Otamatone fits into the blurry space between novelty music gifts and serious music gifts… These are strange but addictive musical instruments, and they’re great gifts for music lovers. Pressing on the Otamatone’s tail produces different notes, and opening its mouth will change the tone. From here, the music-making possibilities are endless. The regular Otamatones are perfect cheap novelty music gifts. If you’ve got a little more to spend, the larger Otamatone Deluxe is easier to play, and has an output for plugging into an amplifier. Both versions run on batteries, and the Otamatone Deluxe can also take an AC adapter. There are hundreds of YouTube videos out there with people playing these things, and they’re incredibly addictive instruments once you’ve learned the basics. The Otamatone is superb value for money for the amount of fun to be had, and they’re great gifts for musicians of all ages. This is a super unique instrument that has to be seen and heard to fully understand, so take a look at the video below. Click here to check out the regular Otamatone, and see the Otamatone Deluxe here. Their uniqueness alone makes them one of the best music gifts, and this is something your music lover really won’t expect when unwrapping it! There are some amazing gifts for musicians in the $80 to $150 price range. Here are some of the best music gift ideas, including accessories, instruments, and some really cool music gadgets. As far as portable speakers go, the BOOM 2 is one of the best, which makes it one of the best gifts for musicians. For starters, the BOOM 2 is waterproof and shockproof, with a huge 15 hour battery life and an incredible sound for its size. This speaker puts out 360-degree sound, and also has a built-in handsfree microphone. The BOOM 2’s PartyUp feature allows linking up multiple BOOM 2 speakers to put music everywhere, and friends can take turns playing music from up to 3 Bluetooth devices at once with Block Party mode. The BOOM 2 can play sound via Bluetooth or auxiliary input, which gives musicians excellent versatility with plugging in instruments or other sound sources. For example, you can plug the Vox amPlug (reviewed above) or iRig (reviewed above) directly into it, to create a portable instrument/mic speaker without needing an amplifier. This is perfect for taking musical instruments anywhere, for a battery-operated super portable music system. The BOOM 2 also has Apple and Android apps which add extra features, like a 5-band EQ, musical alarm, and remote on/off. All of the above features make the BOOM 2 one of the best gifts for music lovers, guaranteed to keep their ears happy for years to come. All-in-all, this Los Angeles based company has built a great-looking and great-sounding speaker. The Ultimate Ears BOOM 2 comes in a huge range of colours – take a look at them all here to find the right gift for your music lover. A great guitar strap is a gift your musician will keep forever, and Lock-It make the best. This is a hand-sewn premium leather strap, made in the USA (the company is based in Dallas, Texas) for acoustic guitars, electric guitars, and bass guitars. It features Lock-It’s patented strap locks, designed to hold tight to avoid unexpectedly dropping the guitar… This will ensure your musician’s expensive guitar will never hit the ground while they’re playing. This top quality guitar strap is made from strong high-grade leather, plus a much softer central area which is extremely comfortable on necks and shoulders. It can be worn comfortably for hours at a time without rubbing or causing problems. Lock-It guitar straps are excellent gifts for musicians thanks to their amazing quality, thoughtful design, and built-to-last ruggedness. They’re worn by guitar innovators like Rob Balducci, High McDonald, and Charlie Sexton…. That should be enough to tell you that this will be the only guitar strap your musician will want to wear. The high quality of these straps makes them excellent gifts for music teachers, top graduation music gifts, or perfect for any other really special occasion. Check them out here. Teenage Engineering’s Pocket Operators are a range of really cool music gadgets for musicians. They’re mini sequencers used for making beats and melodies. These are really powerful little music creation tools with built-in sounds, effects, patterns, and some other top features. Musicians can program beats and tunes, and then play and edit them on-the-fly. They were an innovation when they were released, and they’re one of the best music gifts out there. Pocket Operators feature a built-in speaker, and an output for using headphones, speakers, or professional audio gear. Some great onboard effects are included to manipulate the sounds, and everything can be programmed live and saved for later. The PO-12 Rhythm is a great little drum machine sequencer, with drum kit sounds and excellent effects for building beats. Get this one if your musician loves beat making. The PO-14 Sub is a deep bass line synthesizer, to create great bass tones and melodies. There’s also a micro drum machine to combine beats with the bass. This is the best gift if your musician loves bassy melodies. The PO-16 Factory is a melody synthesizer, for creating keyboard-style melodies and manipulating them with some amazing effects. There’s also a micro drum machine included on this one. This is the gift to get if your musician plays piano, keyboards, synth, or guitar. All Pocket Operators can be linked up and synchronized, so you can combine two or more of them to make some high quality music. The new PO-33 KO take all of this a huge step further, allowing musicians to record their own sounds directly to the device. Recording is possible via either the built-in microphone, or the line-input. Musicians can then trim, pitch-shift, and add effects to these sounds on the device, opening up a huge world of sonic possibilities. The best part is, all of this is incredibly easy to do. Musicians can record vocals, beats, instruments, other sequencers, or any other sound source to build a great library of samples. If you’re not sure which one to get, this is the best music gift available in the pocket operator range. The PO-35 Speak is very similar to the recording PO-33 KO, however it allows the recordings to be processed with some great vocal synthesizer effects (think robot-style voices). The effects are really varied, and they’re superb quality. These are great gifts for singers, although they can be used with any instrument or sample. If you’re looking for cool gadgets for musicians, Teenage Engineering’s Pocket Operators are the perfect gifts. They’re incredibly fun, easy to use, and they’ll open up a huge new range of sonic possibilities for your music lover. These are serious music creation tools for adults, but they also make excellent music gifts for music students and younger musicians (we’d recommend ages 8+)… Younger music lovers will have a lot of fun making music, while learning about production, sequencing, and synthesized sounds all at the same time. The PO-33 and PO-35 are the best music gift options due to their added recording capabilities. These things sell out quickly, so if you see one, grab it. The other versions also make amazing gifts for musicians (and they’re slightly cheaper). These will definitely be hit music gifts, regardless of your musician’s style or instrument of choice. Shure’s SE215 in-ear monitors are perfect gifts for musicians, regardless of the instrument they play. These monitors can be used for live shows, rehearsing, solo practice, and studio recording. As a bonus, they’re also great when used as regular earphones for listening to music on the go. Within this price range, the Shure SE215 are the best-selling in-ear monitors available, and it’s easy to see why: This Chicago USA based company have built a great product here. The sound is clear and full, and there is great isolation to block outside noise. Musicians are constantly exposed to loud volumes, so it’s critical to protect your hearing. Isolating in-ear monitors do this by blocking outside noise to stop hearing damage. Wearing isolating earphones also means you don’t need to turn up the volume to dangerous levels to hear properly (this is a big problem with performing music while wearing regular earphones). We said above that quality hearing protection is one of the best music gifts you can give, and it applies here too. Beyond great sound and great isolation, the SE215 also has a detachable cable, which can even be swapped for a wireless Bluetooth adapter. Shure have been making world-class professional music gear for over 80 years, and their line of in-ear monitors are used by professional musicians worldwide. These are great music gifts for singers, drummers, guitarists, and other musicians… They’ll clearly hear themselves, their metronome, backing tracks, and the rest of the band while playing, practicing, and recording. Note: It’s important to get isolating earphones (like the Shure SE215 reviewed here) for loud environments. Regular earbuds don’t protect your hearing from loud sounds, meaning you have to turn them up far too loud to hear anything… This, combined with loud instruments and speakers, is a recipe for hearing loss disaster. It’s critical to use good quality hearing protection: This makes Shure’s SE215 monitors one of those music gifts that are extremely practical, useful, and important. Shure’s Beta 57A is an extremely versatile professional-level microphone for vocals and instruments. These are one of the swiss army knives of microphones, making them perfect gifts for singers and other musicians. In this price range it’s one of the best microphones available, and it’s excellent value for money. Shure is a go-to brand for professional musicians and audio engineers worldwide, and their microphones are used absolutely everywhere. The versatility of the Beta 57A makes it one of the best music gifts for busy musicians. The Shure Beta 57A performs extremely well both live and in the studio. It’s a directional microphone, meaning it can easily handle noisy environments without creating feedback. This microphone is brilliant for live performances and rehearsing: It’s comfortable with both loud and quiet sound sources, and it can be turned up very loud before problems (like feedback) arise. When used for recording in the studio, it can capture vocals and instruments with excellent precision. The Beta 57A’s crisp and full sound makes it perfect for singers, guitar amps, drums (this is my go-to mic for recording snare drums), wind instruments, and most other non-bass instruments. The versatility of the Beta 57A makes it one of the best gifts for musicians who perform, rehearse, or record. Check it out here. Looper pedals are excellent gifts for singers, guitarists or bass players. These pedals allow you to record instruments or vocals, then instantly play back and re-record in a loop to create great layered performances. Looper pedals are incredibly useful, and they’re a lot of fun to use… This makes looper pedals one of the best gifts for musicians. These pedals can be used at home alone, when rehearsing, when playing live, or while recording. TC Helion’s Ditto Looper is one of the best looper pedals available, and there are versions for singers and for guitarists/bassists. The Ditto Looper is a small but powerful professional-level pedal. It can record up to 5 minutes of uncompressed high quality audio, and it’s capable of recording an unlimited amount of loop layers. This lets musicians build anything from simple looped melodies to extremely complex arrangements. Because of this, it’s one of the best music gifts to allow your musician to get creative. The Ditto Looper has controls to undo and redo a loop, start/stop playback, and erase all parts. The internal memory will keep loops stored even when the pedal is powered off, so your musician can take their musical creations anywhere. When not in use, the Ditto Looper has a true bypass, meaning it lets audio pass through without altering the sound at all. If your musician has other effects pedals, the Ditto Looper can be easily linked up with them. Importantly, these pedals are high quality, and they’re designed to handle the kind of abuse that happens with busy performing musicians. The entire enclosure is made from solid die-cast metal, and there’s a 3-year warranty. These pedals are used by some of the best musicians in the world, and they make perfect music gifts for singers, guitarists, and bass players. If you need a gift for a singer, this is the model to buy. Otherwise click here to see the guitar/bass version. As a bonus for vocalists, TC Helion also make the MP-75 vocal microphone which fully controls the Ditto Looper. This is a great addition if you’re buying this gift for singers. The microphone also works with many of TC Helion’s other microphone effects boxes (like the Mic Mechanic and Harmony Singer). You can often find packs with the microphone and the looper/effects pedals for cheaper than buying the microphone on its own! Check out the Ditto Looper + Mic Bundle or the VoiceTone + Mic Bundle. These are great tools to help musicians take their performances to the next level, and they make perfect gifts for singers. The EBow is a powerful secret weapon for guitarists, and they’re the perfect gifts for musicians who play this instrument. These great little gadgets are used to imitate bows, horns, woodwind instruments, and other-worldly sounds – all on an electric guitar! They work by vibrating the guitar’s strings to produce an endless sustain, with a rich and full sound. Depending on the playing technique, a huge range of sounds are possible with this one device. There are some great tutorial videos available (like the one below) to showcase some of the amazing things the EBow can do. The versatility of the EBow makes them one of the best music gifts for guitarists. This is a really cool tool from a Los Angeles USA based company, and it’s made a mark across the globe… EBows are used by some of the world’s best artists to push their guitar sound to new levels. These are great gifts for guitar players, to inspire them and to really expand their toolkit of sounds. Check out the video below to see exactly what this device can do, and click here to see more. In this price range, there are some seriously great gifts for musicians… these things will blow them away. We’ve included some DIY music gifts, some really cool music gear, and practical gifts to help musicians stay organized. The Korg Volca Sample is an amazing tool for creating music. This is one of the best gifts for musicians who like to make songs alone, with friends, or on stage. There are some great features allowing beats and music to be built from scratch, and then edited and manipulated for some really unique performances. The Volca Sample comes with some high quality pre-loaded sounds. These are ready-to-use new and classic style sound samples for musicians to get creative with. Musicians can easily record their own samples, and load them onto the unit with Korg’s AudioPocket app (for Apple), or with the Caustic app (for Apple, Android, and PC). This allows musicians to create songs using audio samples of absolutely anything they can find (e.g. vocals, drums, instruments, environmental sounds, etc.). Beyond recording your own samples, there are a huge range of free sounds available online from websites like freesound.org… Websites like this one have a wealth of high quality free sounds that can be used on the Volca Sample. The versatility of the Volca Sample is why it’s on our list of the best music gifts. The Korg Volca Sample comes with some great built-in effects and editing tools, and the interface is very intuitive and easy to use. It runs on batteries, or with an optional power adapter.The huge range of sonic possibilities make these sequencers excellent gifts for music lovers. They’re perfect for musicians who play instruments, for singers, or for bedroom producers to tinker with. They can be used alongside other vocals/instruments, or played completely on their own both at home or on stage. Korg’s Volca range also has bass, synth, keyboard, and a great drum version (which we actually covered in our top gifts for drummers article). Click here to see the full range of Korg Vola Sequencers, including the Volca Sample. For general music creation, the Volca Sample is the best gift: The others are great, however they don’t allow musicians to use their own samples. These headphones are a very nice step up from the AKG K 240 (reviewed above), and they’re amazing for the price. The Audio-Technica ATH-M50x sound excellent, with a great response across all frequencies. The ATH-M50x are one of the best music gifts out there due to their build quality, sound, and style. These headphones are perfect gifts for music lovers, because they don’t alter the sound too much: you hear everything in a recording, the way it was meant to be heard. This makes ATH-M50x headphones really useful for both music listening and great gifts for musicians creating their own music… You get a nice accurate representation of sound, regardless of whether you’re listening to it or recording it. These headphones are super comfortable, and they create a good seal around your ears (so you don’t need to turn them up super loud to drown out outside noise). Importantly, the cable is detachable, meaning these headphones won’t become useless if the cable breaks. You actually get three cables in the box: one straight and one coiled 9.8′ (3m) cable, and one straight 3.9′ (1.2m) cable. This is handy, because your music lover can swap the cable depending on where they’re listening… Use the longer one at home or in the studio, and use the shorter one for listening to music on the go. The Audio-Technica ATH-M50x also comes with a carry pouch, and a 1/4″ adapter so they can be used with phones, mp3 players, computers, and all professional audio gear. If you want to go wireless, there’s also a Bluetooth adapter available separately. Great headphones are one of the best music gifts for musicians, and the ATH-M50x are the absolute best choice for the price. They’re available in black, white, blue, gun metal, or red: Click here to see the full range. All musicians end up with a lot of stuff… Stuff to carry to shows, to rehearsals, to music lessons, and everywhere else their passion takes them. Because of this, a great musician’s backpack is an essential music gift. The Gator G-Club Large Backpack is one of the absolute best available: These are perfect gifts for musicians, regardless of their instrument. They’re guaranteed to thank you for helping them get organized, and for reducing their setup/packdown times. Gator specialize in one thing: making instrument bags and cases for musicians… They have an amazing product range specifically designed to handle music gear, touring, and heavy use. Importantly, everything is backed by a lifetime warranty (just hold on to the receipt). The Gator G-Club Series is a tough large backpack, with extra padding to keep music gear safe. There’s special internal storage for audio cables, and a bright orange interior which is super helpful when finding gear in a dark venue. This bag also has a built-in rain cover, to ensure nothing gets damaged in the rain. The inner pockets are specifically designed for things like mixers, laptops, microphones, hard drives, headphones, DJ gear, small keyboards, interfaces, guitar tuners, pedals, and other professional audio equipment. There’s also plenty of spaces for those little bits and pieces that musicians need. Oh, and there’s one other great thing with this bag: The inner pocket is the perfect size for carrying vinyl records. These Gator backpacks are the perfect gifts for musicians on the move with their instruments. There’s always extra gear to carry as a musician, and it’s priceless to have one great bag to store everything in. As well as a backpack version, Gator make a carry bag and rolling bag for storing gear: click here to take a look at the full range. Tip: If you can’t find these specific Gator bags, look for backpacks designed for DJs… It’s a well-known secret among musicians that DJ bags make the best bags for music gear, regardless of the instrument you play. Vinyl has made a huge comeback across the last few years. Along with the bigger bands, even smaller independent musicians are now releasing their songs on vinyl. As far as gifts for music lovers go, a great turntable is hard to beat. The Audio-Technica ATLP-60 Bluetooth turntable is amazing, and one of the best gifts available in this price range. As well as having the usual wired outputs (headphones and RCA out), Audio-Technica brings vinyl into the future with Bluetooth connectivity. This allows listening through Bluetooth headphones, or with Bluetooth speakers (like the Ultimate Ears Boom 2 reviewed above). Most importantly, this turntable sounds amazing… Audio-Technica have been making professional audio gear for decades, and their expertise really shows here (this turntable is a twice VIP award winner, and it has some really great reviews). The ATLP-60 Bluetooth is a fully automatic belt-driven turntable, capable of playing 331⁄3 and 45 RPM records. It comes with a removable hinged dust cover, and has a switchable built-in pre-amp (for connecting devices both with or without a dedicated turntable input). All of this translates to the ATLP-60 being one of the best music gifts out there. The Audio-Technica ATLP-60 Bluetooth turntable is available in black, white, or navy. They’re the perfect gifts for music lovers, click here to see the full range. These are great DIY music gifts, perfect for guitarists who love to build things. The DIY guitar kit includes absolutely everything needed to make a great sounding and great looking electric guitar. All parts are high quality and precision-cut, with the guitar’s neck custom-built to fit perfectly with the body. This DIY guitar pack comes with a pre-drilled guitar body, fretted neck, all of the guitar’s hardware, and all necessary electronics. once built, your guitarist will just need to add a finish or a design to the body and neck (e.g. paint/varnish/clear coat). They can customize the look of their guitar as much as they like, to create something really unique and personalized. Check out the DIY guitar pack here. Bass players aren’t forgotten either… Take a look at the DIY bass guitar version available here. For something a little more elaborate, check out the double-neck guitar kit. These are great gifts for DIY musicians, and a unique project for them to personalize. So we’ve covered a DIY guitar and bass above. Now here’s one for synth and keyboard players, or for any other musician who likes to get creative: a build-your-own synth kit… These are outstanding DIY music gifts for musicians who like to tinker and build. This kit is co-designed by LittleBits and synth experts Korg (we reviewed one of Korg’s great sequencers above). The Korg LittleBits synth kits are perfect DIY music gifts for both kids and adults. Younger users will learn a lot about the science of sound, and the electronics behind synthesized audio. But this isn’t just for kids: Experienced musicians can also use this DIY synth to create some great music… This is actually a really powerful music making tool. If you’re buying this music gift for a younger music lover, be very careful the adults don’t take over! In the box, you get a very nice range of smaller modular components that snap together magnetically. No soldering or wiring is required, and each component will either produce or alter a sound. The type of sound changes depending on how they’re linked together, how they’re played, and they type of input. Components include delays, envelopes, oscillators, micro-sequencers, keyboards, speakers, and more. From here, a great range of beats, melodies, and songs can be created by your music lover. LittleBits also make add-on bits, including microphone inputs, light sensors, mp3 players, temperature sensors, Bluetooth and MIDI adapters, lights, and a lot of other audio-producing gadgets. All of this is designed to be mixed and matched, to produce an endless range of creations. These LittleBits synth kit sets are the perfect DIY gifts for music lovers, regardless of whether they’re kids or adults. Check them out here. Okay, if you’re spending big on music gifts, you only want the absolute best. All of the gift ideas below are specifically designed for high-quality music creation, recording, and listening… These are some of the best music gifts available in this price range, and they’re guaranteed to put a smile on your music lover’s face. These packs are perfect gifts for musicians to record at home or on the go, with everything needed to track vocals, guitars, bass, keys, or almost any other instrument. The only instrument you can’t record well with this pack is a full drum kit, although the included microphone and extra input will be fine for good basic drum recordings (see this one-mic drum recording video for an example). Focusrite make excellent recording gear, and their Scarlett range is one of the absolute best cost-effective quality recording interfaces on the market. This means they’re one of the best music gifts out there for musicians to start recording. This Focusrite Scarlett 2i2 pack includes a large diaphragm condenser microphone, cables, headphones, microphone stand, pop shield, and Pro Tools professional recording software. The main feature is the included Scarlett 2i2 interface, which has two high-quality inputs for recording up to two things at once (e.g. vocals, guitar, bass, keys, drums). The only thing your musician will need is a computer or laptop (this pack works on both PC and Mac), and they’ll be set to create their own high-quality recordings. The interface accepts both XLR and TRS inputs, which means it will record anything you can throw at it. These recording packs are excellent music gifts for musicians, inspiring creativity and helping them take their passion to the next level. Focusrite are experts in top quality recording gear, and their Scarlett interfaces consistently get amazing reviews across the board. In particular, these packs are perfect gifts for singers and singer-songwriters: they’ll be able to record vocals with the included microphone, and they’ll have the option of recording instruments as well. Click here to see the full pack. If you’ve read our section on Teenage Engineering’s Pocket Operators (reviewed above), you’ll already know that these are some of the best gifts for musicians on the market. Pocket Operators are mini sequencers allowing musicians to program their own beats and melodies, or record their own sound and vocals. Well, there’s also a great pack available with the three newest (and best) Pocket Operators… It’s called the Metal Series Super Set, and it’s an excellent gift for music creators. The PO-32 Tonic, PO33 KO, and PO35 Speak are included in this pack – that’s a highly programmable mini drum machine, an extremely powerful mini recording sample sequencer, and an advanced mini recording vocal synthesizer. The pack also comes with protective cases for all three devices, and three sync cables (to link them all up). Put together, it’s one of the best music gifts out there. These three professional-quality mini sequencers are the only things your musician will need to create an endless number of songs. You can synchronize and create music with all three of these Pocket Operators at the same time: build drums, record samples, create melodies, and input vocals, all with high-quality effects. From here, the possibilities are endless: Use them as stand-alone music creation tools, or for backing guitar, bass, keys, or vocal arrangements. If your musician loves creating music, the Pocket Operator Metal Series Super Sets are absolutely amazing gifts to spoil them with. These are really cool gadgets for musicians, and they’re extremely versatile. Click here to see this great music-making pack. KRK’s Rokit 5 are excellent sounding home monitors (high-quality speakers) for serious music lovers… If you’re looking for gifts for musicians who record and/or mix their own songs, these monitors are it. KRK Rokit 5 are designed to play back music exactly as it was recorded. This is extremely important for musicians, because we need to know how our material sounds… This is the reason why recording, mixing, and mastering can’t be done with standard consumer-audio speakers. Creating music with monitors (like these) will improve the sound when the finished product is played back everywhere else. As far as quality monitors go, these are some of the best music gifts out there in this price range. The Rokit 5 are perfect monitors for small home studio/recording setups. They have crystal clear sound, and can handle everything from super low bass up to very high frequencies. There’s dedicated volume controls, and controls for adjusting high frequency output (which is important to tailor the sound to a particular room or taste). For plugging into equipment, the Rokit 5 have everything your musician will need: The audio inputs include an unbalanced RCA, balanced TRS, and balanced XLR. This means that these monitors can be plugged into computers, laptops, mixers, interfaces, mp3 players, phones, and any other professional audio gear. As a final bonus, these things sound amazing for general music listening. Parties will be taken up a notch, and you can expect a lot more music playing around your musician’s house. KRK Rokit 5 monitors are one of the best gifts for musicians who create music, or who just love listening to it. Check them out here. These are perfect gifts for musicians who perform on stage. The CAD Audio StageSelect IEM is a wireless in-ear monitor system, allowing performing musicians to hear themselves and the rest of the band clearly. This music gift lets your musician hear everything on stage through quality musicians’ earphones. Compared to regular wedge-style stage monitor speakers, a wireless in-ear monitor system is a huge step up. Musicians are able to be much more precise with performances, because they’ll hear everything perfectly. Confidence increases, and there’s less chance for feedback and sound problems. The StageSelect IEM pack has everything your musician will need to get a professional-level wireless in-ear monitor mix. The transmitter plugs in at the mixing desk or on stage, and the wireless receiver clips to the musician’s belt or inside their pocket. In-ear monitor earphones are included, or your musician can plug in their own. These are particularly great gifts for singers – it can be especially hard to clearly hear your own vocal performance on a noisy stage. Beyond just vocals though, any musician will benefit from this wireless monitor system. CAD’s wireless system is designed for interference-free transmission, with 16 different channels available. The other musicians in the band can also get their own receivers and tune in to the mix. The unit can run one stereo signal or two different mono signals, which is handy for sending two different mixes to multiple musicians on a stage. These are incredibly useful gifts for musicians – they’ll thank you for improving their performances, and they’ll quickly grow much more comfortable and confident on stage. Click here to see more. What’s a theremin? Well, it’s an instrument that is played without touch. It sounds futuristic, but theremins were actually the first electronic instruments ever made. They’re played by moving your hands towards or away from two metal antennas attached to the instrument. The two antennas control the pitch and volume, and with this almost anything is possible. Theremins are, quite simply, really cool music gifts. With the theremin, musicians can create moving soundscapes, big melodies, dreamy progressions, and really beautiful effects. Similar to regular synthesizers, theremins will add excellent depth and fullness to songs, taking them to a new level. These are great gifts for musicians, because they open up a wealth of new creative possibilities. Moog are masters of synthesizers, and their theremins are absolutely top notch… They’ve been making them for over 60 years. Moog’s Theremini is their newest version of this instrument, with some next-generation features designed for today’s musicians. As well as playing like a regular theremin, the Moog Theremini has an option for pitch correction, making it impossible to play a wrong note. There’s also a built-in tuner, to help less experienced players consistently hit the right notes as they’re learning. The Theremini also has built-in delay effects, and 32 different presets to give a huge range of sounds. All of this makes the Theremini one of the best music gifts for creative musicians. The Moog Theremini comes with a built-in speaker, headphone output (for silent playing), 1/4″ stereo line-level output (for live performances and recording), and CV out (to connect to analogue synths). There’s also a USB port for MIDI in/out, which is really cool – it connects the Theremini to computers or MIDI devices for use as a controller (giving access to an endless number of sounds and effects). 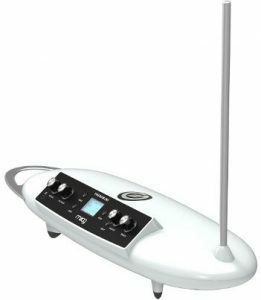 These are really cool music gadgets for musicians and music lovers… Thereminis make great gifts due to the huge range of musical possibilities they open up. Take a look at the video below to watch it in action, and click here to see more. The Zoom H6 is the most advanced portable recording device on the market. It captures high-quality audio via its own interchangeable microphone capsules, or by plugging up to six instruments and microphones into the unit. Zoom’s H6 is incredibly powerful, and it’s perfect for recording any kind of music. When it comes to gifts for musicians, these are one of the best. Firstly, the interchangeable microphones are purpose-built to capture high-quality audio. They’re perfect for recording rehearsals, live performances, or for practicing at home. The Zoom H6 also handles up to six XLR or TRS inputs, letting musicians plug in microphones and instruments. This turns the H6 into a 6-track recording studio, with the ability to capture and mix each track individually. The unit even provides phantom power to microphones. Nothing else is needed to record entire songs and albums, making the Zoom H6 one of the best music gifts for serious musicians. Musicans can record and overdub up to 99 takes through the six inputs. From here, it’s possible to instantly mix song into a stereo mp3, or move everything to computer for further fine-tuning. Want more? The Zoom H6 can also handle capturing audio directly to a computer: it’s also a fully functional 6-channel audio interface. This lets musicians record to professional audio software (e.g. Pro Tools, Logic, FL Studio, Ableton, Garage Band, etc. ), with separate tracks for each instrument. The Zoom H6 isn’t just for recording audio: It can be combined with a camera to create high-quality videos, which is perfect for recording live shows. 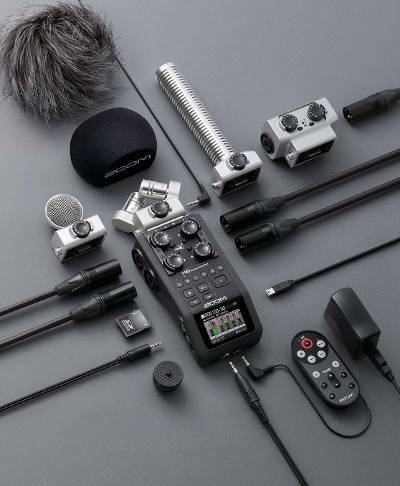 Attached to a camera, the H6 captures sound through its own stereo microphones, or from up to 6 channels from the mixing desk, vocal mics, or from the instruments directly. The H6 makes our list of the best music gifts because musicians can use it at every single step of the songwriting process: recording their rehearsal sessions to aid songwriting, doing pre-production, recording studio-quality songs and albums, then capturing their live performances. The Zoom H6’s features make it one of the most cost-effective and easiest ways to capture professional-quality audio. This is an incredibly powerful portable device for writing, recording, and performing music. For all of these reasons, the Zoom H6 is one of the absolute best gifts for musicians, giving them everything they need to create and record their music. There’s a great H6 pack available with two microphone capsules, headphones, SD card, carry case, cables, and more: Click here to check it out. …Wait, you need more suggestions for music gifts…? 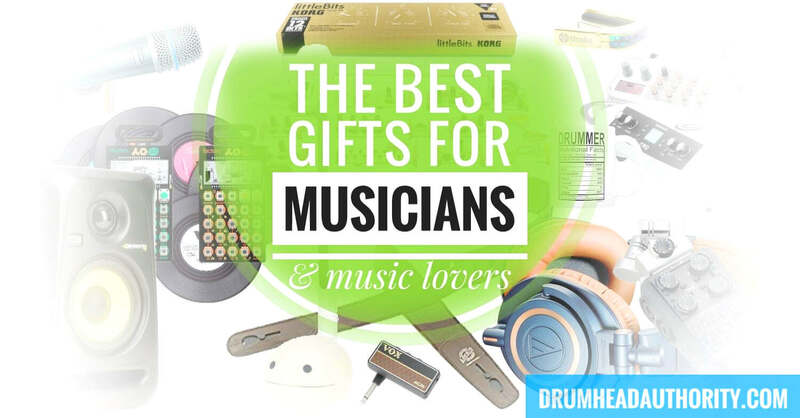 If you’ve checked all the gifts on this page and you still haven’t found the best gift for your music lover, then take a look at the best selling CDs and Vinyl on Amazon, or check out the top selling music instruments and gear. There are some top music themed gifts on both of those pages. If you still can’t find the best gift, then get in touch and we’ll try and help you directly! Found any other great for music gifts out there? Want to let us know what you got for your musician’s birthday gift or Christmas gift? If you know any great gifts for musicians that fit this list, get in touch!